Walk through metal detector is playing a more and more important role in today’s security system, especially for public facilities. Here you can find details for this classic walk-through metal detector, specifically designed and engineered to security need of schools, hotels, amusement parks, city halls, and so on. The Classic metal detector adopts leading edge detection technology, generating a high flow rate thanks to excellent discrimination capability. Personal items such as coins, keys, belt buckles passing through the magnetic field will not case an alarm. There will be both visible and audible of high intensity whenever suspicious object detected. This walk through detector come with the features of high level detection uniformity, rapid installation and easy maintenance, portability in application as well as high affordability. It can detect a wide range of both magnetic and non-magnetic weapons, conforming to all international security standards. 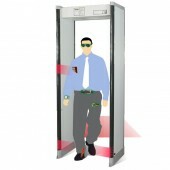 The safety metal detector is of compact size and very light weight. It is highly applicable to any surroundings. The equipment can be easily installed even without involving any special training for normal use. With all functions programmable and controlled by microprocessor, the system is easy to operate with digitally-adjustable sensitivity setting with wide range of values. Superb ease of use and efficiency.The shipping is fast too. The walk through door has been well tested. Seems everything right. Actually works a bit better than i expected and out of my surprise for the simply construction. Really easy to install. We put it into work almost effortlessly.